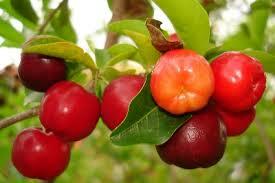 The acerola There are 6 products. What is that the acérola ? This is about a small cherry that grows in Brazil and that is incredibly rich in vitamin C.
The spiruline is very rich iron and poor in vitamin C.
The iron of the Spirulina will be better assimilated if you consume at the same time a source of vitamin C.
The acérola which I propose you is organic and rich at height of 25 % in vitamin C natural. How many I take ? The AJR for the vitamince C is of 80mg / in the daytime but we can increase doses until 500mg / in the daytime and 1000mg / in the daytime for the sportsmen. To have an antioxidant effect, take at least 500 mg / day of vitamin C. This corresponds to 2 g of acerola powder Let be a teaspoon. ~ In case of big fatigue, of intense physical effort, or examination. 1/2 daily coffee spoon (approximately 2,5g) will be enough. It corresponds approximately in 100g of acérola for 6 weeks of cure. ~ And in the time ? It depends on you at first.If you are tired, a cure of 3 months will do you good. For the people who wish to remain in shape, a cure of 1 month at the time of the interseasons (spring and autumn) will be enough. 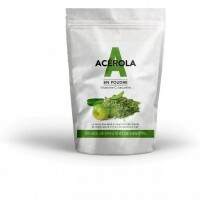 In this case, for 2 bags of spiruline you can take 1 bag of acérola. It is important to consume the spiruline and the acérola at the same time. 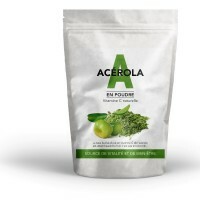 The microseaweed ( the spiruline) and the fruit ( the acérola) enter then synergy.